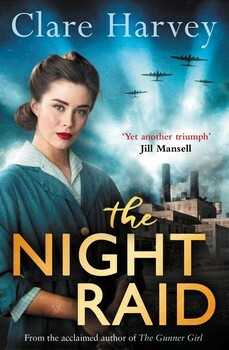 This novel by a Nottingham author thankfully avoids much of the overly sentimental themes which can spoil some books set in the Second World War. The “Blitz Spirit” is often seen as a bit of an illusion, almost manufactured to suit the propaganda needs of an embattled nation. This historical novel depicts three women whose involvement with an Ordinance factory changes their lives in profound ways, and there is far more than a surface endurance despite the strains of the Home Front. The atmosphere of personal relationships threatened means that decisions are made with far reaching circumstances. A well-known artist becomes involved in the lives of young women whose prospects seem bleak; it is an imaginary episode yet is written in a believable way. Sometimes coincidences seem too much, but overall much that is positive emerges from this novel of realistic drama which goes beyond the “Night Raid” of the title. Laura Knight was an artist who had always pushed the boundaries of what was acceptable. Her husband, Harold, was a noted portrait painter in a very traditional style, while Laura chose unusual subjects and depicted them in colourful and challenging ways. In this novel Harold is an elderly man, and Laura is a war artist who has had some success with painting “Ruby Loftus”, a girl working on heavy machinery to produce vital weapons. Financial necessity dictates her arrival in Nottingham to paint war workers. One of the girls she decides to paint, Violet Smith, is already in trouble. Unmarried mothers are shown as having little choice about their babies, and Violet’s own sister has placed further strain on her large family. She knows about life on the poverty line, and her work in munitions is not only vital to the war effort. Zelah Fitzlord is concerned for the welfare of the young women who work at the factory; it is her unusual qualities and determination to help that first interests George Hanford, supervisor of the night shift. What happens is partly under the control of these people, but fate continues to take a hand and occasionally tips into situations which can be a little too foreseeable to the reader, but Harvey manages to rescue the narrative before it becomes too awful. There is a tragic element of the story, but ultimately hope emerges in several ways. I enjoyed this novel for several reasons. The writing is clear and the characters well defined. A balance is maintained between the problems that the characters face and the outcomes that left hope rather than misery. Laura’s unhappiness is seen from the inside, but also she is depicted as a strong and determined character as well as a sensitive, almost compulsive artist. While this is a fictional episode in her life, I think that it is well grounded in what is known about her, and no slander is committed. Zelah is a great character, determined yet vulnerable, and it is the little details about her that catch the attention and make her believable. Violet’s behaviour makes her a victim in some ways, but she is consistent in her spiky, realistic way. The small details of light, weather and behaviour are telling in a book which is perhaps not great literature, but a readable picture of women’s lives in a particularly difficult time, with some engaging writing and a clear story. Laura Knight the artist featured in our visit to Nottingham Castle and Museum today. It was an accessible place to visit, once we had worked out that the gate would open to allow us to get to the Disabled parking space! There were three of her paintings on display, not the best known (most of which we saw in an exhibition a few years ago in Newcastle), but including “Motherhood”, which is a thoughtful study of a mother and child. I bought the postcards, needless to say!